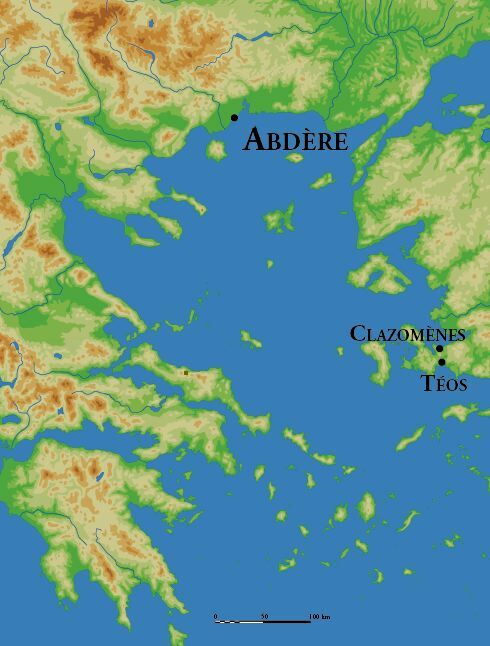 Democritus was born in Abdera in Thrace, northern Greece, in 460 BC, and died at the remarkable age of 90 (or perhaps even older). He was a follower of the little known Leucippus and together they are credited with first putting forward the concept of atoms. Contrary to many of their more famous rivals they interpreted Nature in a mechanistic way – such that natural phenomena were free from the interventions of gods and supernatural causes. Their ideas on the nature of matter and the workings of the body etc., were thus remarkably close to our present day science-based world view. Perhaps unfortunately for them, and indeed for the whole of western science, their ideas were given little credence – and for over 1,000 years the writings of their arch opponents Plato and Aristotle held sway. Indeed it was said by Aristoxenus that at one point Plato wanted to burn all the works of Democritus, and was careful never to mention him in his own writings. Democritus believed that things consisted of an infinite number of very small particles called atoms (from the Greek atomos indivisible). These atoms were seen as eternal, and it was believed that there were many different kinds of atom, which could move about randomly – occasionally colliding and joining to form a new substance. Whilst each atom was indestructible, the things they created by combining with others were not. Democritus summed up his views by saying “nothing exists except atoms and empty space; everything else is opinion”. This concept of matter was in opposition to the ideas of many contemporary philosophers, who saw water, air, fire and earth as primordial substances from which all else was formed – in a world largely ruled by the whims of gods. His ‘atomic viewpoint’ gave Democritus interesting insights into areas such as reproduction and evolution. He said that all parts of the body contribute to the seed from which a new animal grows, and both parents contribute seed. Parental characteristics are inherited when one parent’s seed predominates over the other for a particular character. He also thought that species do not exist for ever, unlike the atoms from which individuals are made. Democritus also wrote extensively on: ethics, the senses, theology (which he disliked), geometry and the nature of the soul or psychê. Although none of his original works have survived we know of them through the writings of Epicurus and others. 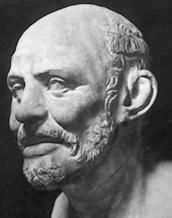 Democritus came from a well-to-do family, and travelled extensively around the classical world, living in Egypt for seven years before returning home more or less bankrupt – a condition which perhaps gave rise to his famous saying “by desiring little, a poor man makes himself rich.” He was known as “the laughing philosopher”, apparently due to the high value he placed on cheerfulness, and he believed that “the best way for a man to lead his life is to have been as cheerful as possible and to have suffered as little as possible... The right-minded man is he who is not grieved by what he has not, but enjoys what he has. He is fortunate who is happy with moderate means, unfortunate who is unhappy with great possessions.” His outlook on happiness was similarly uplifting, “happiness does not dwell in flocks of cattle or in gold. Happiness, like unhappiness, is a property of the soul... Men find happiness neither by means of the body nor through possessions, but through uprightness and wisdom.” Perhaps of more interest to our friends over at SCC English, Democritus also found time to suggest that “there is no poetry without madness.” You can't say fairer than that.